Our suburban house is surrounded by mature redwoods, pine, oak, sycamore and birch trees. Red tail hawks nest in the tallest trees and a variety of birds visit during the day. At night, owls can be heard. Raccoons, possums and skunks have been known to stroll through the yard. When we first moved in, it wasn’t unusual to hear and see gray squirrels playing “chase me, chase me” across the rooftop. Trimming tree branches cut down on the games, but the sound was familiar. One winter morning, that changed. We awoke to an ominous thud on the roof, followed by another and another. We could hear the sound of footsteps across the roof. It sounded like a group of thirty-pound squirrels up to their old game. Puzzled, and a little bit concerned, we opened the front door and found a flock of wild turkeys in the front yard. One by one, they flew up to our roof, landed with a thud, ran to the back edge of the roof and launched themselves down into the backyard. It was hard to believe they could fly, and yet they were almost graceful. They were truly magnificent. We’ve gotten used to their winter visits, although they do leave interesting organic calling cards. I tell myself they eat grubs, and that is a good thing. 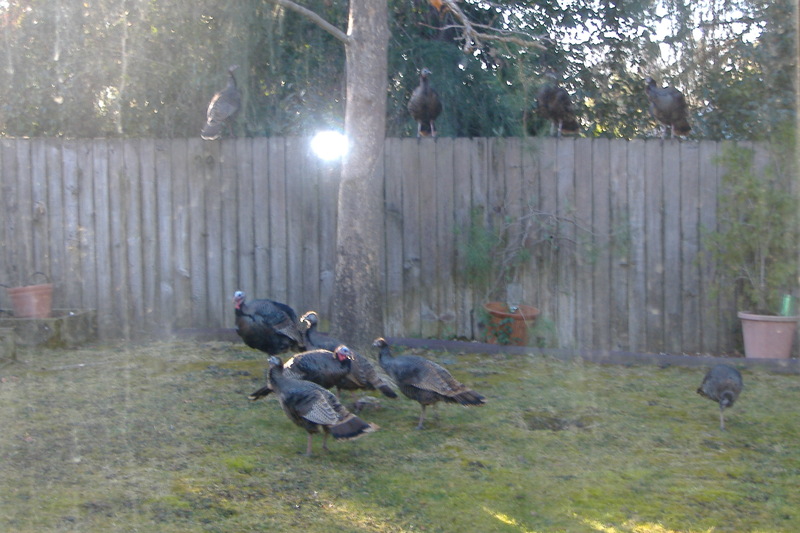 One morning, watching the usual flock in the backyard, I noticed an odd-looking turkey. The same size as the turkeys, this bird had light gray feathers and a crown of plumes on its head. 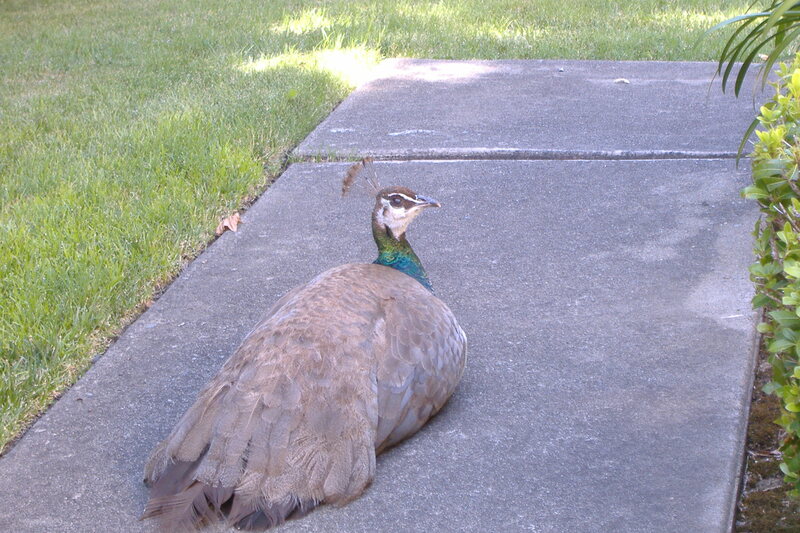 It was definitely a peahen. It lacked the long tail of a peacock. She was accepted by the turkeys, roosting with them on the fence and searching for grubs and seeds in the grass. I saw her once or twice with the flock, and then she disappeared. I checked with a local bird expert who told me that since peafowl and turkeys are different species, it was unlikely that a peahen would hang out with a flock of turkeys. 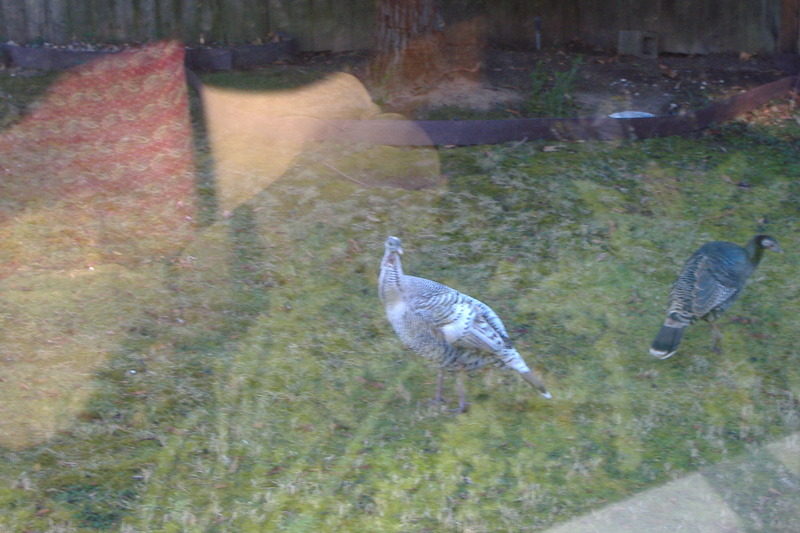 In April of 2011, long after our turkeys’ winter visit was over, I walked out the front door toward the driveway, intent on some errand, when I saw her again. She was sitting on our walkway where the sun had warmed the concrete. Her only movement was to turn her head and look over her shoulder at me. She did let me take her picture. After about an hour, she flew away. What, you may well ask, does this story have to do with the writing process or children’s literature? The issue here is, in a sea of wonderful, imaginative children’s books, how does an author write a story that truly stands out? How does one craft a story that fits reasonably well into the typical publishing categories (picture books, chapter books, young readers, middle grade, young adult), and yet stands out, just as the peahen in the middle of the flock of turkeys. I realize there is no easy answer to this question, but I am interested in how other writers have dealt with this issue. By the way, the current flock of turkeys has at least two birds with almost white feathers – but I’m sure that is just the result of a recessive gene, nothing to do with the peahen. Hope to hear from you. Take care. Hi Dr Dre – I use Word Press. This is one of the simplest formats. I’ve had it for about 2 years and I’m probably due for a change. When I first started, my niece, who worked for Microsoft, recommended Word Press. They have a wide variety of formats available. Thank you for your comment, and good luck!